Social media and News networks are buzz with news that Menaka Gandhi is taking a serious look at online trolling as a minister for women and child development. There have been countless articles before in pro-Bharat websites like Indiafacts.org about how Maneka Gandhi is turning the ministry for women into an anti-men ministry and is making it hostile for men, but this step seems to be a step too far. Though it looked like a joke at first, it is turning to be a real problem with Maneka Gandhi doubling down on her nonsensical rhetoric. As per some reports ,the great and knowledgeable minister was having a meeting with Twitter India heads like Kashmiri Jihadi Raheel Khurshid on tackling online trolling against women in India , after having successfully completed her obligations to help poor women of India. She claimed to have created a new IT cell to deal with online trolling against women. The problem with this stupid move should of course be obvious to anyone. There is no proper definition of what constitutes as “trolling” and hence this kind of nonsense is nothing but recipe for trouble and censorship. The esteemed minister is keen on helping the entitled middle class princesses on the internet, who are also strong and independent and need to be protected from online trolling because they are strong and independent and hence cannot click the ignore button in Twitter and Facebook against trolls, partly because she has already helped all the poor women and children across Bharat suffering from malnutrition and lack of proper facilities and partly because those poor women and children are less important than saving the hurt feelings of middle class women on the internet. The irony and hypocrisy here of course is that the same twitter head, who is supposed to control trolling after this move is a huge abuser himself and was exposed for his trolling behaviour here in this article by Rupa Subramanya. Here is the twitter India head trolling a girl child. Will Maneka first book him under trolling? Needless to say, the RW in Twitter was up in arms against the minister on this brain dead idea because of the vague nature of the issue. They rightfully point out that this is similar to 66A type of internet censorship and this kind of activity and proposal by the minister can be used to suppress the unpopular opinions in the internet. This will further increase burden on the already uphill task the Right wing pro-Hindu netizens have to face in social media, with Facebook being run out of jihadi den of Hyderabad, which closed down several RW pages for exposing Islam and criticising terrorists and anti-nationals. On the other hand Twitter India head is an anti-Bharat and anti-Hindu Kashmiri Jihadi doesn’t even hide his anti Hindu views. Sometimes Facebook deletes and mysteriously makes the accounts of even famous people like Tarek Fatah and Pamela Geller to disappear when they are critical of Islam (i.e. tell the truth about Islam). Twitter of course bans handles which make fun of Islam like @juntakareporter and does not verify people with pro-Hindu views in India. So when the minister is giving such vague anti-troll measures and excuses to these websites, it will give them legitimacy to censor the RW and pro-Hindu people in the Twitter and Facebook and the results would be as good as giving torch to a monkey. The irony of all this brain dead drama is that the whole issue started with a known abusive troll masquerading as journalist/presstitute called Swati Chaturvedi, who goes by the user name @bainjal. She abused a RW pro-India Twitter user and was replied back in kind. She whined and complained about it as her usual presstitute self and the half clown goon Varun Gandhi came to her rescue saying that women should not be abused and defended her right to free speech and abuse of others. Interesting enough, the clown never bothered to defend other RW women and BJP supporters before that point despite being a BJP member. Turns out, the Swati Chaturvedi presstitute had written positively about Varun Gandhi goon just a few days back in dailyo.in and why he should be the face of UP BJP campaign, even though the clown has zero appeal in UP politics on the ground. So bainjal had pressituted for her new client Varun Gandhi and in return the clown came out in support of his presstitute friend on Twitter under the garb of protecting women from abuse, without looking at the history of @bainjal. When Varun Gandhi joined the kinder, gentler BJP of Vajpayee and Advani, much was made of the Gandhi brand. Unfortunately, Modi and Shah only have a visceral antipathy to the name. Insiders say Shah and even Arun Jaitley can’t stand both mother and son, finding them arrogant and affected. His future under Modi and Shah is rather bleak, to say the least. To be fair to Varun, he’s always maintained that he would not attack Sonia Gandhi and cousins Rahul and Priyanka in public. While Vajpayee understood this, and in his own thoughtful and genteel way, appreciated this family deference, Modi and Shah have no use for it. They would prefer Varun to target Sonia and Rahul much in the manner in which Subramanian Swamy does. The various Right wing handles who see the Varun Gandhi trash for what he is connected the dots and started making fun of the obvious presstitution by the Gandhi and Lutyens media member. 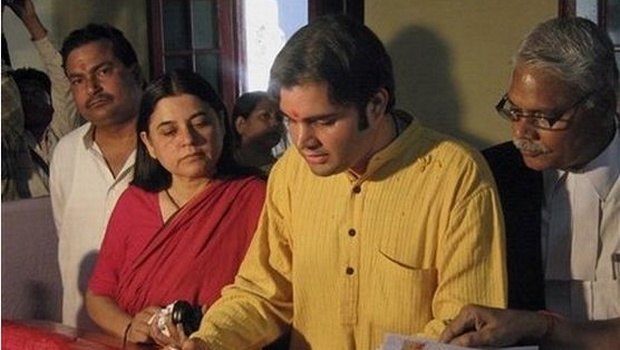 It seems Varun Gandhi ran to his mommy Maneka Gandhi complaining about it and now she being true to her last name is trying to ban those RW handles for making fun of her son and his CM aspirations on Twitter under the garb of protecting women from trolling. The minister Gandhi claimed that she had so far received 1500 names of people who abuse on Twitter and is expecting more and that action would be taken soon. This has enraged the RW and pro-Hindu Twitter handles in India like anything and they are up in arms against the Gandhis with many handles making fun of her pathetic attempts to hide their son from criticism and the blatant misuse of their powers. This series of drama by the women and child development minister of course has no legal basis and is completely illegal and if allowed to happen will overwhelmingly hurt the support base of NaMo on social media, which was instrumental in him becoming the prime minister with overwhelming majority in 2014. So why is the BJP minister so keen on destroying BJP’s own support base? After all, isn’t it BJP’s loss if they lose the social media to AAPtard and Congtards and lose the battle of narrative if there is no social media to correct the lies and misinformation that the mainstream media spews against the incompetent morons at BJP? Most of the media hitjobs against the government are tackled by the online Hindus, who sacrifice their time and effort to dispel the poison the media spews against the BJP government, out of their own interest, to save this country from the anti-India and anti-Hindu filth in the media and the Lutyens ecosystem. So wouldn’t the loss of social media dominance of BJP thanks to its RW supporters be very bad for it, seeing how media cell of BJP is run by a bunch of incompetent idiots, incapable of articulating anything properly or keep the anti-national and anti-Hindu trash in the media where it belongs i.e. trash bin? One of the wildly circulated theories for the seemingly stupid behaviour of the Gandhis of BJP, among the Right wing circles in Twitter is that Maneka Gandhi is sabotaging Modi when Modi is not here and is trying to get her useless son, Varun Gandhi, the Uttar Pradesh chief minister berth ahead of the UP elections. This might be a too clever by half attempt by Maneka Gandhi to sabotage the heavy support Modi enjoys at the moment at the national level by turning the BJP supporters against the BJP government and at the same time trying to eliminate the popular Twitter handles which mock the clownish thug Varun Gandhi for the worthless gasbag that he is. And if BJP tries to kick her out for her sabotage right after the ministry reshuffle, she can play victim card about how modi stopped her from helping women being trolled in front of her gang of media presstitutes(no offence to prostitutes). Some handles even claim that Maneka Gandhi is doing it at the behest of Congress in the light of UP elections and hence can join Congress if she indeed is kicked out of BJP for the sabotage that she is doing. Below is one possible set of reasons for Maneka’s move as explained by Dr G Pradhan in his tweets. While that may be the most logical explanation for the brain dead activities of the Gandhis in BJP, the another very real possibility is that BJP itself doesn’t want the freedom in Social media. It’s not a big secret that BJP views its social media supporters as an unwanted nuisance as they constantly expose the backstabbing and secular than thou sell out of Hindu interests by the BJP. For a large part, the social media is uncontrollable and many Hindu handles in RW are getting disillusioned by the complete back stabbing of Hindus by the BJP on its cultural agenda. Some prominent BJP trash like Chandan Mitra have even openly called the BJP online supporters as trolls in debates on NDTV in front of the queen of presstitutes i.e. Burkha Dutt. So it might be that even BJP might be eager to get rid of its critics on the internet and live up to the Sita Ram Goel’s observation that BJP is just Congress+Cow to continue in the secular sell out mode un-criticized by the social media and hence might not act against this pathetic and undemocratic anti-free speech move by Maneka Gandhi. But whatever may be the underlying reason, one thing that is absolutely clear is that the Gandhis are cancer to Bharat whether they are in BJP or in CONgress. After all, the blood of Nehru would still have its influence on its progenies and hence it would be naive to assume that Gandhis in BJP would be any different. Goes to show that Bharat needs a Gandhi Mukt Bharat alongside the Congress Mukt Bharat as envisaged by Modi.